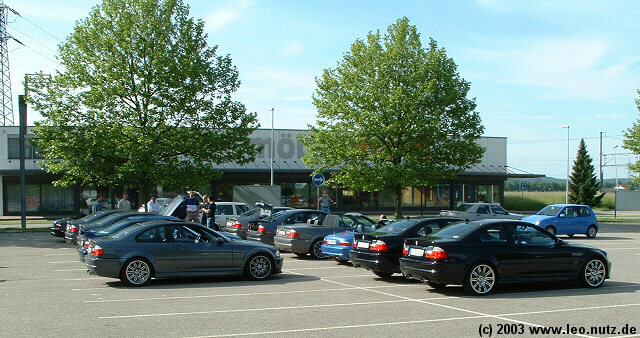 The meeting place was on a parking lot of a shopping mall. As usual Dragi had to show off by opening his hood so all could see his pride and joy Group M intake and other little goodies. Our first stop to have a break in ''Moulin-Neuf''. Dr. Nagano seems to be satisfied with the result of the first part of the tour. In the meantime we took on the roads as we usually do with events like these. After our second trip the guys needed another break, a pee break that is The 2 pictures below were taken some where between ''Kleinlützel'' and ''Lucelle''. Here a picture from another position with Phil76's roadster seen in the foreground. Ok, so why the line? Well, our infamous Dr. Nagano set up his video equipment for some bypass foto shooting. Picture taken somewhere in France. 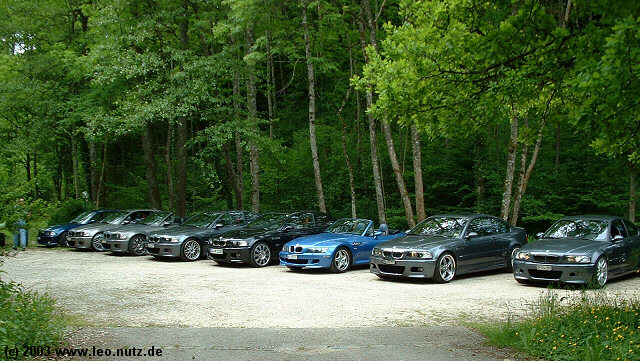 Here all our babies lined up at the restaurant parking lot as we have our lunch break in ''Les Rangiers''. 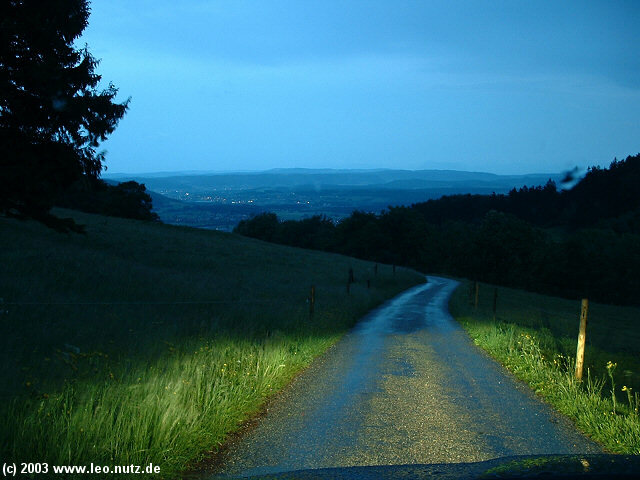 This picture was taken in ''Vue des alps''. 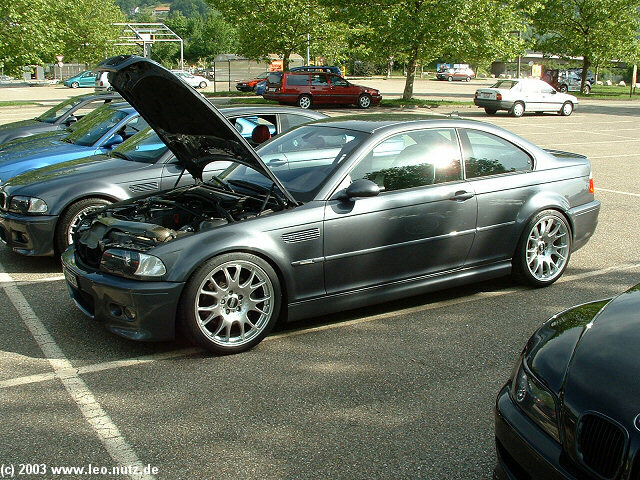 In the foreground is MillM3's E36 M3. After a great time having dinner with the gang it was time for me to leave as I had a very long drive back home. I punched in my route in my NAV and took off. Well, my NAV didn't take me around the mountains but rather over it thru deep parts in the woods and at times very narrow dirt roads. I contemplated turning back as I really had thought my NAV didn't know what is was doing. I figured I was lost. However after coming up to an opening in the woods and could see a town in the background and figured my NAV was on the right track after all. I then made the picture seen below. When all was done and after having a hard days work my baby was back in the garage with 1274 km (796 miles) more on her wheels. Currently 9 users are browsing this web site, 628062 having visited since June 8th, 1997.